“Flow” is that essential but elusive design concept that can make or break your style. If a home flows then transition spaces between rooms seem to melt away. Everything in a home with flow feels unified and harmonious. Flow can be hard to achieve because it requires big-picture thinking. Every design element needs to work towards flow, but if you focus too much on similarities the whole design can feel boring. 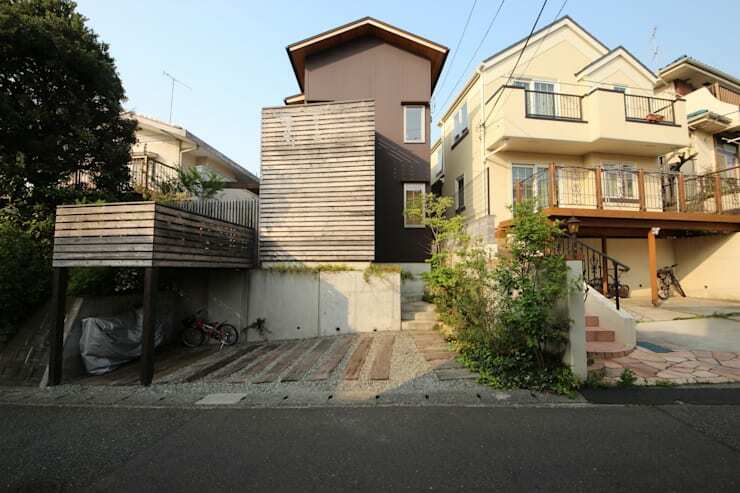 Japanese architect Arai Chongwen has mastered flow with this romantic Japanese home. The interior and exterior spaces in the home flow together, creating some stunning courtyards that can be enjoyed from the living room. All of the space of the home are united by warm and natural style elements. 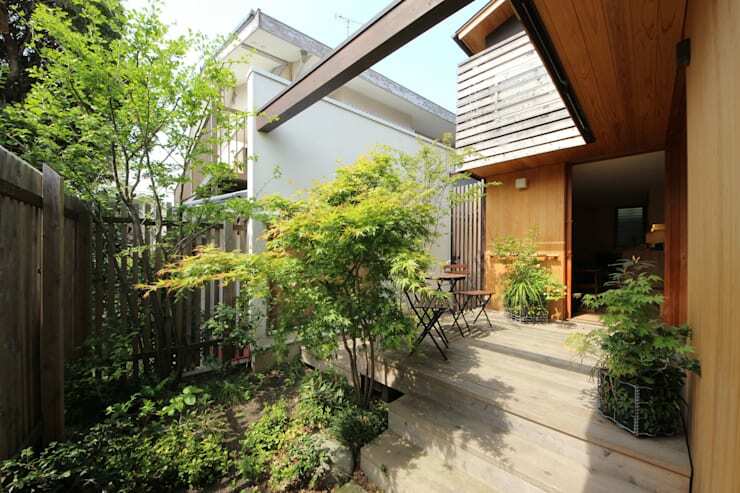 It feels romantic and private despite being an open-concept with ample outdoor space. Let's take a look at what makes this space exceptional. As you walk up the wooden steps to the house you'll notice that the same planks are used for the fencing, making for an easy transition upward. The gravel and the concrete base of the house match, also helping with flow. Otherwise, the long dark purple facade is eye-catching and topped with a simple roof. The same wooden slats are still here as the walkway, turning into an elegant porch. 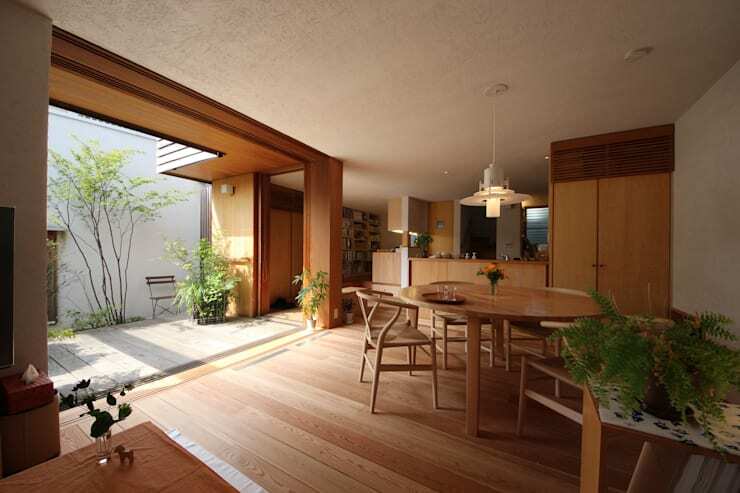 The wood on the house stands out, with a light shade that feels very warm and welcoming. But the continuity created by the several different types of wood here, including the trim and balcony, keep the focus on an earthy vibe. With bright greens inside and outside of the building its hard to tell where the house truly begins. If the house felt open to the elements before, it feels absolutely in tune with them now. The light but warm wood is made full advantage of on every surface. The natural lighting is sweeping, and tempered with some warm and unique lighting fixtures. That white dining light is ultra-modern and balanced by the small bright flowers beneath it. The hardwood flooring on the interior is laid in the same pattern as the courtyard wood, creating continuity between the two spaces. If you think this is too open for private dinners, you'll love the solution the designers included in this space. Traditionally, these beautiful Japanese screens were used for interior spaces. Now, they are often used as exterior walls and the rice paper windows are reinforced with glass to keep them safe from damage. In this space they make for a bright and romantic room. The globe lighting in the background is a sweet addition, keeping the space aglow for evening entertainment. The back window is made to echo the look of the lovely screens, keeping the flow from one side of the room to the other. This lovely room is tucked into the back of the house, and creates a lovely balance between the open and closed storage. 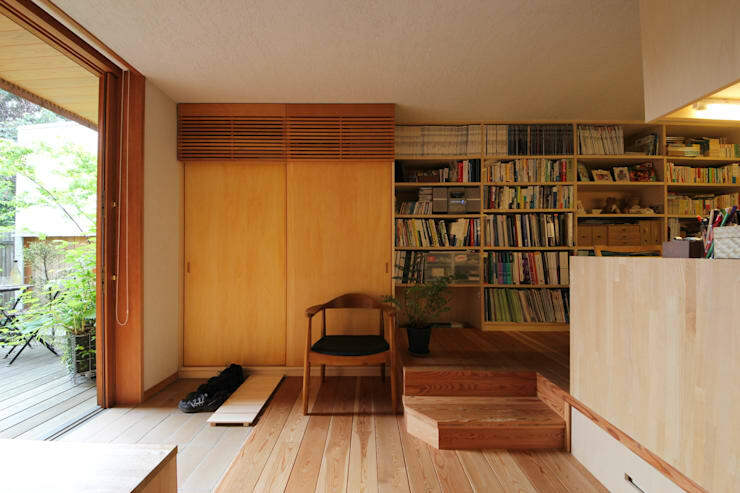 The steps up to the reading room create a sense of privacy for the space and also show off the warmth of the wood. A study done right can be the highlight of the home, we have some fantastic examples for you to browse here. This top-floor bathroom has the same arch as the roof. 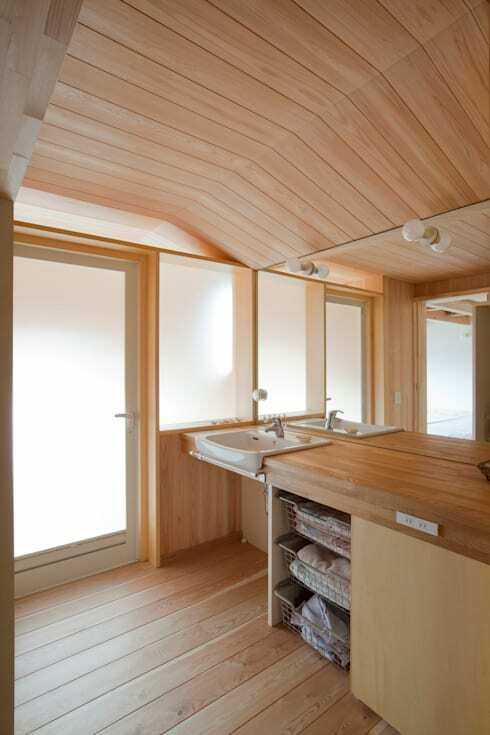 Here the wooden flooring and ceiling feels clean and modern. Forget tiles, this space is easy to clean and can be made just as humidity proof. The glazed glass door and window glow from the outside lighting, washing the whole bathroom in clean light. If you love the use of wood throughout this house you'll love this apartment that was completely transformed by wood. Fantastic lighting has become a real theme in this home. 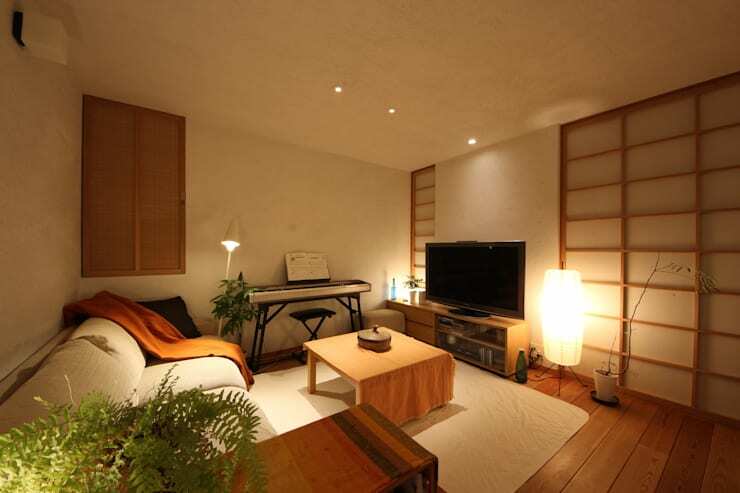 The living room has tall glowing lights on the floor, and cute pot lights in the ceiling, so the residents can have soft lighting whenever they please. The wooden paneling on the sides of the T.V. mimic the shoji screens, creating that essential flow. The carpet pulls all of the disparite elements of the living room together, creating a more private space. Overall, this house is a perfect space to recline and bask in the natural light or the romantic warmth. 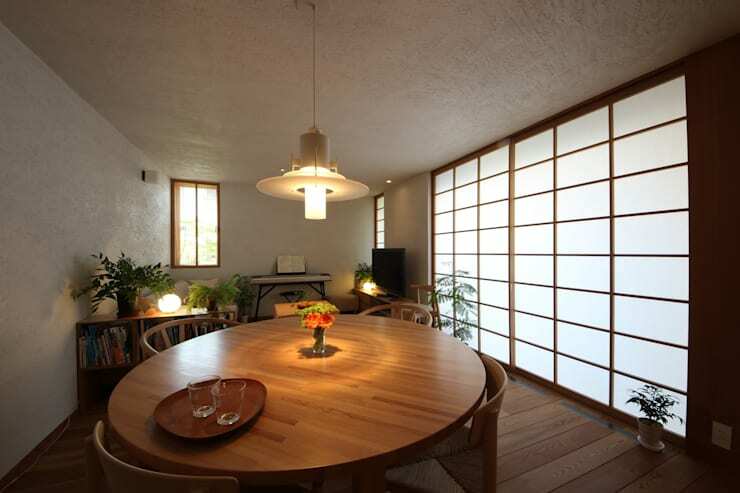 Where could a Shoji screen work in your home? Let us know in the comments!